Not enough fuel, your engine runs lean or not at all. Too much, it runs rich and not only wastes fuel but can cause engine damage as well. Air mixes with the fuel and helps make it lean, rich, or just right. A spark ignites the fuel, but to work, it needs to be timed correctly. Why this quick engine mechanics review? Simple. The exhaust system is a part of airflow and also something called back pressure. This affects valve timing, another important element in how your engine works. The right mix and the right timing, both affect how much your engine emits, among other things, the output of greenhouse gases. In many states, older vehicles are being held to emissions standards even if they’re less rigid than those for more modern vehicles. And if you don’t pass, you can’t license your vehicle. Here is a quick overview of how exhaust works, how it affects emissions and performance, and how to choose the right exhaust system. When the piston moves through its down stroke, it pulls in the fuel and air mixture into the cylinder. This mixture must be just right for the spark to ignite it, which happens as both intake and exhaust valves close or come close to closing – something called valve overlap. The less overlap, the better for emissions, but the right overlap produces more power. On the upstroke, the piston actually pushes the spent air containing the leftover chemicals of the gas explosion, or exhaust, out the exhaust valve. This happens several times per minute (depending on your engine). This air is then sent out your tailpipe through the exhaust system. How this air exits, how fast, and how soon, affects backpressure, which helps close valves more quickly, or can cause them to stay open too long. It also impacts how hot the engine gets. The longer it lingers, the hotter the engine. Most gas vehicles have something called an exhaust manifold. This is where the exhaust exits the engine and is directed into the exhaust pipes. This is what primarily affects back pressure and heat under the hood. Thus the entry of headers. These are often an improvement over stock exhaust manifolds, and a lot of math goes into the curves and angles on these pipes. If you explore them, you’ll notice there are different headers for different purposes. Some are for performance but affect daily driving. Others are designed for economy. That’s because the math is different for each. If you explore them, you’ll notice there are different headers for different purposes. Some are for performance but affect daily driving. Others are designed for economy. The long and short of it is to choose the headers that are right for your engine and the type of driving you do. This will ensure that they work the best under the most common conditions for you. The headers then lead to one of two types of exhaust, single or dual. A quick lesson here that will require more research on your part: It used to be on a V style engine (either V-6 or V-8), that dual exhaust, one pipe from each side of the engine was the way to go. However, with technology advances and some larger pipes, in some cases merging the pipes from the header into a single exhaust has some performance advantages. It all depends on what you want from your truck: power off the line and towing power, higher top speeds where that low-end power doesn’t matter as much, or the most common, a mix of both. By changing exhaust (along with other modifications) you can move the power band of your engine, but it will always perform better in certain RPM and power ranges than others. This decision comes down to science and shopping around. The other advantage to single exhaust is simplicity. You only have a single muffler and catalytic converter, if you have one, to worry about. Another piece of the exhaust system is a catalytic converter. While many older vehicles do not have them, one can be added if you do an entire exhaust system replacement. 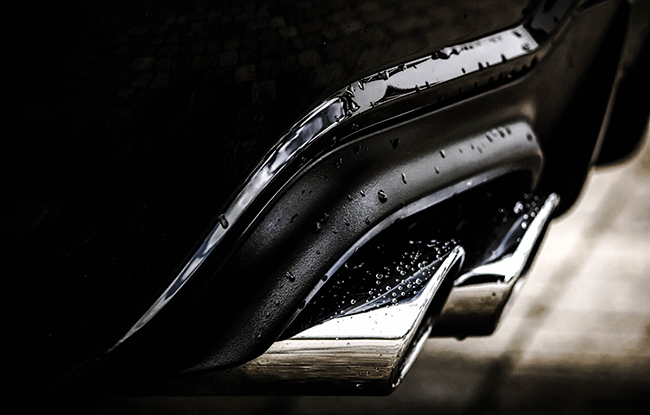 Adding one or more depending on the style of exhaust you have will help curb emissions, and there are aftermarket ones that both help with emissions and enhance performance. The practice of doing so even when the vehicle was clearly intended for on-road use got a lot of speed shops in California in big trouble. This practice is largely out of date now. When modifying your exhaust, it’s important to not only understand the science but the Federal and State regulations that govern your actions. The last part of the exhaust system is the muffler. The primary purpose of this component is to reduce sound, and it does so using baffles. These baffles, much like the parts of the catalytic converter, slow the exit of exhaust from the tailpipe. In some cases, this inhibits the engine’s ability to “breathe” or exhale the exhaust quickly enough. This is why “Cherry Bombs” or other mufflers that offer less resistance are such popular parts of an exhaust replacement. They are usually louder than stock mufflers and some give the engine a rumble or note that drivers really like. The key is to know the science of how the muffler will affect the performance of your vehicle along with local noise regulations and how you might be affected by those as well. Not all replacement mufflers are created equal, and some can be clamped into your system while others need to be welded. Your exhaust system is a vital part of your vehicle, and it’s important to understand the basic science behind all the parts and how changing them might have an effect on your performance, and what regulations govern it. Once you get past the basics, understanding exhaust is much like understanding breathing.